The conditions right now are absolutely unbelievable. I haven't posted any updates as of late simply because things haven't changed much. The low, clear, and stable flows continue to grace both wade fisherman, DIY floaters, and of course the guide team. I wouldn't have imagined we would have such great June fishing and conditions. This winter I had 18" of snow at my house on the north side of Ellensburg and I was cringing with every snow flake! Although lots of water is good I remembered back to 2009 when we cancelled about 2/3 of our trips in June and were guiding the river at 6,000 cfs regularly. At least I was. I enjoy that kind of challenge. This year we're less than half of that flow and the river works for everyone right now especially DIY floaters. Right now the flows are at +/- 2,700 cfs. At this volume there are LOTS of gravel bars to wade out onto and plenty of fish positioned out away from the shoreline. This makes wade fishing a very feasible option and I encourage you to get out here ASAP. If the weather is going to be over 85 degrees no waders, under that you may want waders. I like the Simms Intruder Boot for wet wading in the Yakima Canyon. Keep in mind you'll fish differently on foot than you would in a boat or with a guide. This is because you'll be casting multiple times over the same fish. Lighter tackle, tippet, and smaller flies are generally more effective. Fish smaller nymphs in the morning under an indicator of your choice. I like Yarn or a New Zealand tool because it spooks less fish. Get a comb and some floatant. Avoid fishing large Stonefly or Hopper patterns unless you are using them to support a dry fly. These big flies are appealing to aggressive fish only, and chances are if a fish is aggressive you can still get them on a small fly if you are wading. A big fly cast over the same spot multiple times just lets the trout know you are there. Small dry flies from 1 pm - dusk are a good plan. Look for feeders and approach with caution. One good drift is more valuable than 10 mediocre ones. Stay under control. Look for color changes. The gravel bars or slots that fade from brown into green generally hold fish. Look for hydraulics indicating larger boulders. Water should be moving faster than walking speed. Cast upstream most of the time, work upstream, then walk back to your rig. Working downstream doesn't slack line your flies very well. Stand in the right spot. See video. This is a great time to row your own boat. The flows are not swift, there are bars to stop and wade, and you can anchor up in many spots and fish from the boat. We rent 3 person fishing rafts that are safe, affordable, and all the trailering and transportation is included. Here is one of the boats that we rent. Its $199 per day, split it 3 ways if you can. Shorter floats of less than 10 miles for a full day is best. Sure the guide you went with that one time did more, but we don't have to stop, slow down, and figure stuff out. Plus we rig and re-tie new leaders and flies on like its magic. Fish one fly. Why do you always fish two flies? Do they tangle more? Seriously now. Keep your ship tight. Less tangles, more good drifts, no snagging the bottom, less snagging the bank. Slow down and have the rower focus. The rower has the most important job in the boat by far. Keep the raft parallel with the current, slowed down, and be constantly back rowing the boat. Its hard work, but eventually you'll learn to become very efficient! Keep a hatch rod rigged up. AT ALL TIMES. Generally a group of guys isn't going to be able to anchor the boat, re rig a leader, light tippet, and a small dry fly efficiently enough to take advantage of that occasional rising fish. What will happen is you won't. You'll keep fishing your nymph or your streamer and let that opportunity pass you by. Get a 9' 4 weight and have it always rigged up with an X-Caddis and ready to pick up a riser at any time. I will always have a hatch rod ready when I am personally floating the Canyon. Time is money. When your relax do it well. Have a snack, have a beer, etc. This is supposed to be fun. But when you fish, focus. Concentrate on the task at hand and fish and row your very best. These trout are smart and if you want to be successful it will take ALL of your concentration. Many anglers simply want to fish at the highest possible level. If this is you... get a guide. I personally fish with guides always. After being one and fishing with guides I can't go back on this. Its just a different level of efficiency. This doesn't mean everyone should fish with guides. Figuring out the hatch, the game, making your own decisions etc. is part of the challenge. 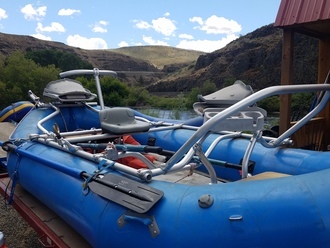 The boat handling of a Yakima River Canyon guide however has immense value. Our guides are good. Get your own gear. Buy a fine fly rod, use it, get used to it, use the same rod every time. Fly rods are special and if you are that guy that always uses the guide's gear that's fine but you'll get better if you have your own stick. Get wading gear. Maybe its just a pair of Simms Sandals, or maybe its a heavier duty shoe or boot but anglers that ask to wade fish a small part of their trip seem to get more out of the day. Let the guide know what you enjoy. Too many times anglers in an attempt to "go with the flow" don't get to do what they love. Maybe you love streamer fishing? Or wade fishing, or fishing dry droppers? If there is a section of river, strategy, or fly that you like please let us know. We strive for 110% customer satisfaction. Help us help you. Ask questions. Get us talking and it will enhance your experience. The better you get to know your guide, the more he'll chat with you in his human voice and I'm willing to bet his instruction gets more clear and personal. This helps us get to know you better at the same time and the lines of communication improve. We ask questions too, but sometimes you are quite focused on fishing and don't hear us haha. The following insects are currently present, I truly believe and hope that you'll stop into Red's and get some real time advice from the shop staff for advice. Yes, we have some green-horn shop staff working at times, but these guys and gals see EVERY FLY THAT OUR GUIDES AND REGULAR CUSTOMERS BUY. Its like having a freaking spy. Take advantage of that knowledge. Our goal is to help you have the best possible fishing, no secrets, nothing held back, just the best service we are able to give you is what we offer. PMD - Pale Morning Dun. These are a #16 sized yellow mayfly. Hatches from 1 pm - 3 pm. Big Yellow Mayflies - #12, early evening hatcher. Caddis - Grey to Peacock colored bodies, #16-18. Evening hatcher. The Caddis you see during the day are generally from the night before. Summer Stoneflies - Black/Tan #10 - #6 - Nocturnal hatch, so the evening dry fly game is best. Yellow Sally Stoneflies - These can provide some good dry fly fishing at times, but a yellow nymph #12-14 is very productive in the faster water. BWO's Blue Winged Olive aka Baetis - #20 - There were fish feeding on these yesterday. Generally you won't target fish with this pattern in June but if you have a big fish that is feeding over and over again and doesn't seem to be on PMD try a little BWO. There are some other bugs of course but this is the main game in late June/early July.